The Rabbit Proto is a huge leap forward in the way we use 3D printers. 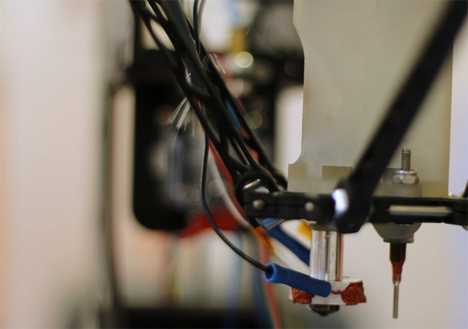 Rather than printing a shell of an electronic object and requiring the guts to be inserted later, the Rabbit fits onto the head of your RepRap 3D printer to print circuits right into the object. Using a 10cc syringe to inject lines of conductive ink, the Rabbit lays down circuits inside of the object as the RepRap printer is making it. The Rabbit Proto is a print head add-on that just plugs into your existing RepRap printer, so if you’re already 3D printing your own stuff at home this will just add an amazing new layer of usefulness to your printer. The video above shows a video game controller being designed and printed, circuitry and all, on a RepRap fitted with the Rabbit Proto. In this case, the syringe is filled with Bare Conductive ink – but the creators encourage people to use novel materials in the print head add-on. The Rabbit Proto team demonstrated one unusual printing material in this video: peanut butter. You can buy your own Rabbit Proto pre-made from the group or find instructions for making your own on GitHub.